The commissioner can serve notice to the defaulter and will ask to pay the amount due. The last date of payment will be also specified. If the amount is not paid during that time then he can recover the amount in the following manner. a). The commissioner has power to arrest the taxpayer and can detain him in prison for the period of six month. b). He can order to sale the property of the tax payer. c). He can appoint the receiver to manage the property of the taxpayer. The commissioner can also issue the certificate to the concerned District officer (Revenue) where income tax defaulter’s property or business or he himself resides. All the details will be mentioned in the certificate. The district officer will recover the amount of tax as an arrears of land revenue. The income tax commissioner may issue a notice to a person from whom the tax payer has to receive the money. Sometimes taxpayer authorizes some person that he can collect the money on his behalf. So this notice is issued such person that whenever an opportunity arises the amount should be paid to the commissioner instead of paying to the taxpayer. On the receipt of such notice the above mentioned persons are required to obey the orders. Sometimes one person makes a series of payment. Such as salary to taxpayer. If taxpayer is a defaulter then commissioner may issue the notice to that person that he should pay the specific amount out of each payment made to the defaulter taxpayer until the tax amount due is paid. Sometimes if commissioner feels that a person who is defaulter will leave the country permanently without paying the tax. He may issue the orders to the immigration officer that such person may not be allowed to leave the country until he pays the tax or makes such arrangement to satisfy the commissioner. Before leaving the country he will show the certificate issued by the commissioner then he will be allowed to leave the country. As the liquidator takes the per session of the office, he issues notice of this fact to the commissioner. The commissioner will inform about tax condition to the liquidator with in 3 months. The liquidator will pay the amount on the receipt of such notice. If the above persons have to pay tax in respect of the members share of the profit of the association it can be recovered out of assets of the association or from a resident members of association. Tax can be recovered from the director of the company other than an employed director. A tax payable by a member is recovered from the association. Any shareholder who owns more than 10% of the paid up capital of the company. A shareholder who pays tax in this way can recover the share of tax paid from the company or from another director or any other shareholder. Some times a taxpayer has paid more than the proper chargeable amount. Taxpayer will apply to the commissioner that amount is paid in excess, it may be refunded. The commissioner will decide the refund application with in 45 days. ii). Application is made with in two years of the date of tax paid or assessment order issued. iii). The commissioner must be satisfied that tax has been over paid. i). This amount of refund may be adjusted any other amount of income tax payable. ii). The refund should be applied against any other outstanding tax. iii). The extra amount paid should be to the applicant. If the return of income presented by the tax payer is accepted without any question, it will be treated as assessment. The total income shown on exemptions claimed by the tax payer will be accepted. The proof regarding the income provided by the taxpayer will be considered sufficient. So assessment and assessment orders both have been completed by the commissioner. Some times as a person was bound to submit the return but he could not do so within due date. In this case commissioner has the power to make an assessment on the basis of available informations about the person. If other party is absent then keeping in view the rules of justice commissioner should make a fair judgement. He should act honestly and should be guided by the rules of justices. The assessment should be very reasonable. He should also keep in mind that assessment is being made against the person who has not provided the information in spite a notice issued. A person fails to provide an evidence in support of his return. If a person fails to provide accounts. Business discontinued but return was not filed. When he is about to leave country without filling the return. Any assessment made before can be amended by the commissioner only. He can change : If he feels that income exemption or relief or tax is calculated wrong in the original assessment order. Such amendment can be passed by the commissioner with in 5 years of the original orders. Revise return itself is treated as amendment orders. 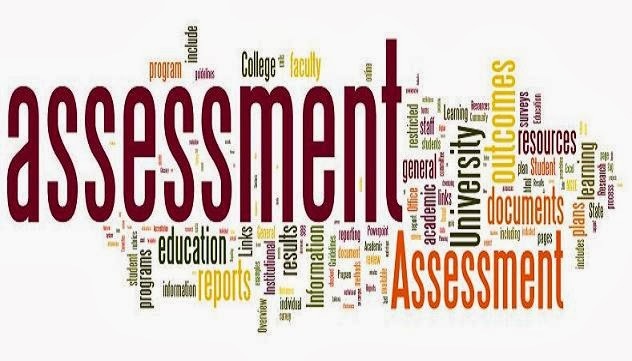 At any time with in a period of 5 years assessment can be amended. Amended assessment of a commissioner can be amended by him again. It is a temporary assessment. If the assessee has not filed the return of any income year. The income tax officer provisionally assesses the total income and payable tax of the assessee. If any person does not show his income and any agency or govt. informs the tax department that such person has concealed the income. In this case commissioner can issue the provisional assessment or amendment orders for the last completed tax year. In this regard the value of the asset is considered as income of the taxpayer. Commissioner can postponed the assessment of such property whose case is pending in the court. But with in one year after the decision of the court assessment orders should be possessed. It means a complete scrutiny of the information’s provided by the taxpayer in his return. So the work assessment has the following meanings in the income tax ordinance. (i). To compute the total income. (ii). To compute taxable income. (iii). To compute the tax. (iv). To compute the refund. (v). To adjust the loss or to carry forward of loss. Deputy Commissioner income tax of that area where principal place of business is situated will make the assessment. Step 1 : A person files the return of his total income. Step 2 : Assessment is made and tax payable is computed. Step 3 : Tax payer makes the payment. Step 4 : If tax payer is defaulter then recovery proceedings is taken against him. Step 5 : If excess amount is paid by the taxpayer then excess tax is refunded. (i). It is necessary for certain persons that they should inform the tax deportment about the total income which they have earned during the year. (ii). They will also show that income which is exempt from tax. (iii). All the information’s they will provide at the end of the year. (iv). All those details they will provide on the prescribed form which is called return. (v). Businessman also includes the income statement, balance sheet and any other document required in the form. (vi). This form return should be signed by the person or his representative. (vii). When the form which is technically called return is duly completed and submitted to the income tax authorities, it is called furnishing the return of income. Following persons are required to submit the return according the income tax ordinance. (ii). Any person whose income is chargeable to tax. (iii). Any person who has been charged tax in any of the 4 proceeding income years. (vi). Any person who traveled abroad. (v). Any person who owns a motor vehicle. (vi). Any person who is owner of immovable property with land area 250 square or mors. (vii). Every person who is subscriber of a telephone. Note : In the above cases (v.vi.vii), a widow, a disabled, orphan below 25 years are not required to file the return. According the following schedule a taxpayer should file the return. Companies :- If the tax year of the company ends between 1st January to 30th June then income return should be submitted up to 31st December of the same year. Other Persons :- All other taxpayers should submit the return up to 30th September next following end of their tax year. Business Discontinued :- If the business discontinued by any person and commissioner has issued the notice to furnish the return then he will submit the return according the date of notice. Extension Of Date :- The period of filling the return can be extended up to 15 days by the commissioner income tax. But this time can be extended if reason of not submitting the return is genuine sickness or absence from country. Exception :- In some exceptional cases it can be extended for a longer period. A tax payer can submit the return in the following way. (i). It may be sent by registered post to the concerned officer. (ii). It may be delivered by hand. The commissioner income tax can issue the notice for the submission of return to any person with in a specified period. Some time the commissioner finds that such person income was chargeable to tax but he has not submitted the return. So this action is taken by him. The notice can issued only in respect of last five tax years. In the following case return can be revised. (i). The return of total it can be revised by the taxpayer before the submission. (ii). After filling the return a taxpayer discovers any mistake or wrong statement it can be revised. 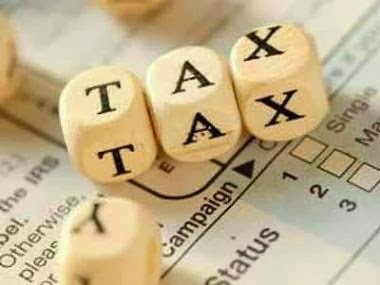 Any taxable income which can not be included in the previous five heads, Such as salary income from property, business or profession and capital gain is chargeable under the head “Income from other sources”. Income from rented machinery plant or furniture. Royalties received by an author. Any unrecovered investment & expenditure. Interest on received on various accounts like profit and loss account or saving or fixed deposits. Rent from the sub-lease land or building. Prize or prize bonds or lottery, puzzles. Sale of irrigation water for agricultural land. Insurance commission received by person who is not employee of insurance company. Any consideration received for the use or exploitation of property. Following are the important examples which are not taxable under any other head but rather treated as income from other sources. (i). Director’s fees received from company. (ii). Tips received by waiters or servants. (iii). Annuities granted by a life insurance company. (iv). Examiner ship fee received by the teacher from board or university. (v). Fee and commission not in lieu of salary. (i). Rent received from a vacant plot of land. (ii). Income received from building kept in lease. (iii). Rent received by a tenant from sub-letting house. (iv). Income from any building which is used for the business or profession purposes. (v). Rent received from the grassing field. (i). Income of a professional examiner is not taxable under this head. (ii). Income of non-professional writer of newspaper. (iii). Share of good will received from the new partner by the old partners. (iv). Examination and enrollment fee received by the bar council. (v). Income of an expert of crossword-puzzles. (vi). Professional dues received after the disconnection of profession. Depreciated assets salvage value is not taxable under this head. Income profit on sale or transfer of assets used for business or profession in respect of which depreciation is allowed under third schedule is not taxable under the head capital gains. 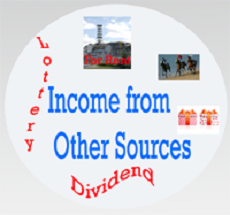 While computing the income from other sources following deductions are allowed. Any expenditure spent exclusively for the purpose of earning such income. Depreciation allowance with a right to carry forward of unadjusted loss of such assets. Interest paid on capital borrowed to earn such income. Insurance premium paid to cover the risk, provided the income should fall under the above head. Current repair of asset, the income of such asset should be treated under the head “Income from other sources”. Initial allowance as per third schedule. It is the fourth important source of income. Such income is chargeable under the head capital gains. Meaning : Any profits or gains arising from the transfer of capital asset is called capital gains. Such income is also chargeable to tax. Any kind of property held by the person is called capital asset. Such property may be connected with his business or not. (v). Patent and copy rights. When the capital assets is disposed off by the person, then capital gain is computed according the following procedure. Capital asset is disposed off with in 12 months of its acquisition. 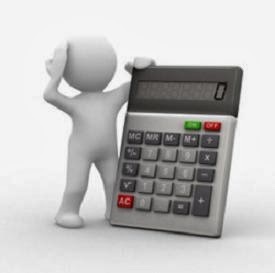 Formula : Consideration received on the disposed of the asset the cost of asset. (i). 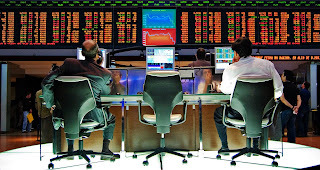 The assets fair market value on the date of its transfer is treated cost of the assets. (ii). Expenditure on the disposal of assets is included in the cost. Note : Following assets are not included in the cost of asset. (i). Expenses of a person which are allowed as deduction under any other provision of the ordinance. (ii). Expenses which are not spent for the disposal of assets. When the capital asset is disposed off after 12 month of the acquisition then 75% of the actual gain is taken for income. Under the head capital gains when we compute the income chargeable to the tax the losses on disposable of capital asset shall be treated as under. (1). Capital loss shall be deducted from the capital gain received on the disposal of any other asset. (2). If capital gain is not chargeable to tax then no loss should be deducted on the disposal of the capital asset. (3). On the disposal of the following capital asset no loss should be recognized. (v). A work of art. (4). On the disposal the disposal of any. 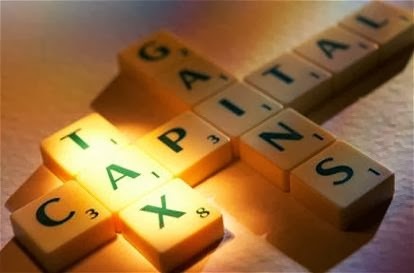 In the following cases capital gain is not included in taxable income. (i). Income from the sale of Modarba certificates. (ii). Shares of public company. (iii). PTC vouchers derived by any ending. (iv). If any foreign investor derives capital gain by selling the shares of public company which are approved by the Federal govt. is exempt from tax. (v). Industrial undertaking set up in a special industrial zone declared by the federal govt. is exempt from tax 5 years. (vi). Capital gain derived from an industrial under taking set up in export processing zone is exempt from tax. Eligible Assets : This allowance is allowed only for those assets which are depreciated assets. Years Allowed : In respect of the following years initial allowance of depreciation is allowed. (i). The year in which first time in the business or profession. (ii). The year in which commercial production was produced. Rate : This allowance is allowed at the rate of 50% of the cost of asset (50%). Ownership of the Asset : This allowance is allowed if the same asset is owned by the same person. Initial allowance for depreciation is not allowed in the following assets. (i). Any furniture or fitting. (ii). Already used machinery or plant. (iii). A road transport vehicle not lying for hire. (iv). If any asset deduction is allowed under any other income tax ordinance. 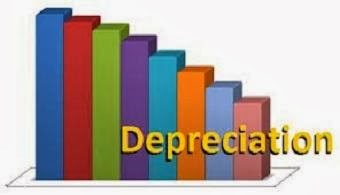 The above depreciation is calculated at the prescribed rate for various typed of assets on the written down value of a depreciable asset. According the following rate normal depreciation allowed. A decrease in the value of asset through wear and tear is called depreciation. The income tax law allows the deduction of depreciation up to certain conditions which computing the taxable profit. Entitled Assets For Depreciation :- Building , Machinery, Plan and furniture are eligible assets for depreciation. Building :- It means a constructed structure and not a land. For example the building of factory. Machinery :- All kind of machines which are used for the business purposes are called machinery. Furniture :- All the fittings are included in the furniture. Plant :- Vehicle aircraft or ship and surgical equipment which are used in business profession are also included in plant. Note : Those books on which investment allowance not been given are also included in the plant. Use For The Business Purpose :- Depreciation is allowed only those assets which have been used completely for the business or profession purposes. If one asset is being used for both the purposes business and personal then depreciation will be allowed according the business proportion. Use During Income :- It is also necessary that such assets have been used only during the income year. Tangible Assets :- In tangible assets like good will are not entitled for depreciation. Only tangible assets like building and machinery are eligible for depreciation. Depreciation Rate :- In the income ordinance schedule III and rule two rates of depreciation had been prescribed. (i). No any depreciation is allowed if the asset is sold of by the assessee in that income year. (ii). At the time of sale if the value of asset exceeds then the depreciated value the surplus will be considered the income of assessee. (iii). If the sale proceed is less than the depreciated value the deficit shall be deducted from the income of a business or profession. Note : If the above conditions are fulfilled then depreciation will be provided. 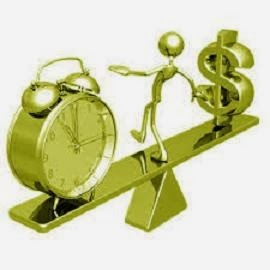 Should Not Exceed Than The Cost :- The aggregate depreciation shall not exceed then original cost of any asset. Particulars Of The Depreciable Asset :- Depreciation claim may be allowed if the assessee has provided all the particulars of the depreciated assets at the time of filling a return of total income. Ownership Of The Assets :- If the assessee is not the owner of the asset then he will not be allowed for the depreciation allowance.